The Montana Sporting Coalition is made up of more than a dozen hunting and angling organizations with a deep commitment to our outdoors traditions. Our diverse interests means at times we disagree on specific issues. But we all recognize the vital role that habitat plays to all wildlife species, and we come together to protect vital areas for our big game, upland birds and for our fisheries. For that reason, the Coalition is opposed to HB 265. This bill would require that the state Land Board approve all conservation easements on private land under the Habitat Montana program. This program is one of our state’s biggest conservation success stories. For over 30 years it has funded conservation easements with willing landowners, targeted fee title purchases of important winter range and other quality wildlife habitat, and fishing access sites. Habitat Montana uses a small portion of hunting license fees, and it’s used to leverage federal and non-governmental dollars to fund habitat projects. It has an incredible track record of success. HB 265 would undo that ruling, and go against the original intent of our Legislature. This bill would create more government buearocracy that is unnecessary for projects that have already undergone extensive review. And it would politicize wildlife conservation and divide Montanans unnecessarily. We need to strive to provide more certainty for landowners to exercise their private property rights, and that’s what the Supreme Court ruling did. Habitat Montana is a quality program that brings hunters and landowners together to achieve results that help farmers and ranchers secure their financial future, while also providing tremendous habitat and public hunting access. PLEASE CONTACT ALL SENATORS AND REQUEST THIS BILL BE TABLED!!! Please be polite but firm. 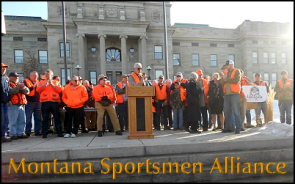 The Montana Sportsman Alliance wishes to go on record as opposing House Bill 550. We oppose this bill because it is a poorly crafted attempt to change the status of roads and their use by the all members of the public across Montana. HB 550 seeks to reduce public use and access while at the same time allowing public funds to be expended for road maintenance. Furthermore, it jeopardizes federal matching statewide road funds for Montana which may only can be dedicated for use to maintain those roads open to public travel. As such, the bill should have a fiscal note to address potential costs as well as the loss of federal matching dollars should it be implemented. There is none mentioned. HB 550 circumvents statutory county authority by pushing decision making on one element of contested roads directly into court, ignoring all other current statutes that require the exhaustion of other administrative remedies prior to litigation. We cannot support any effort to diminish the public’s legitimate use of thoroughfares, the diversion of state and federal dollars to the upkeep of roads that exclusively benefits a hand full of individuals, nor will we support efforts to diminish or unravel the counties’ critical roles in determining rights of ways and road access. On a party-line vote Tuesday the Senate Fish and Game Committee’s Republican majority endorsed a bill and joint resolution urging and allowing the killing of more cow elk in certain regions of Montana. House Joint Resolution 18, sponsored by Rep. Wylie Galt, R-Martinsdale, is a way to help the Montana Fish and Wildlife Commission make the shoulder season more effective and harvest more elk, he testified. Galt also modified the resolution to suggest the inclusion of a list of participating landowners, the dates they would like to see hunters, whom to contact and any restrictions they may have for hunters. Also sponsored by Galt was House Bill 497 that would allow three cow elk to be killed by a hunter each season. Right now a hunter is allowed to kill two cow elk a season. “This doesn’t mandate anything,” Galt said. Quentin Kujala, Wildlife Bureau coordinator for FWP, said in some hunting districts with shoulder seasons the department’s objectives were being met in the first two years. Data from this past season is still being collected and tabulated. Both measures already passed the House, 59-40. The legislation will now move to the full Senate for consideration. Only the Skyline Sportsmen’s group, represented by Sam Milodragovich, opposed HB 487. He said access to elk on private land is the biggest problem and the bill wouldn’t address that. “We believe if you want to limit elk numbers … you have to do it during the regular season when elk are moving,” he said, not during extended seasons when fewer hunters are in the field. Providing more tags doesn’t get to the meat of the problem, Milodragovich said. He was not alone, however, in opposing HJ 18. Yet even opponents said they could support the resolution with changes. Those changes included removing public lands from shoulder season hunts, as the resolution advises, and suggesting specific dates for the hunt. “We’re basically not giving elk a break for six months,” said Nick Gevock of the Montana Wildlife Federation. Jerry Davis of the Montana Bowhunters Association said the Legislature should wait until the Fish and Wildlife Commission gets its report in August or September on how well the shoulder season has worked over the past three years before making any decisions. “We really don’t know if they’re effective in redistributing elk and do what they are supposed to do,” he said. Thomas Baumeister, of the Helena Hunters and Anglers, said his group could support the resolution if the recommended hunt was shorter. “Don’t hit them so hard when they are most vulnerable,” he said, in the late summer when calves are only a couple of months old and mid-winter when conditions for survival are difficult. Milodragovich pointed out that the point of the shoulder seasons is to move elk off of private land. Allowing hunting on adjacent public lands is in opposition to the original intent of the season. Committee member Sen. Mike Lang, R-Malta, said he supported the resolution as a way to deal with overpopulations of elk in his region. Galt, whose family is one of the largest landowners in Montana, said allowing hunting on public land during the shoulder season helps hunters keep hunters from accidentally straying onto landlocked public land and breaking the law while hunting during the extended season. “This isn’t one legislator making law, it is ideas for the commission to take,” Galt said. Public access in Montana is being threatened once again. House Bill 550, introduced by Alan Redfield (R-Livingston), would potentially remove public access from publicly funded legal roads that lead to public land and water access points. In a backdoor attempt to reduce access in places like Montana's Crazy Mountains, HB 550 would remove public roads from the gas tax maps, and by doing so, eliminating one of the main tools used in determining the status of roads. It would also give county commissioners the power to declare public roads - i.e. roads that currently receive public tax dollars for infrastructure & maintenance, and therefore by law must remain open to public - no longer publicly accessible. So, in other words, this bill is an attempt to ask the public to pay for the creation and maintenance of certain roads, but then close them to public use. The bill passed out of the House on party lines. Overwhelmingly, Montanans support preserving or expanding access to our public lands. This bill flies directly in the face of what the majority of Montana voters desire from our elected officials. We strongly encourage all public land owners to email and call members of the Senate Highways & Transportation Committee and ask them to VOTE NO on HB 550. Thanks again for standing up for public access in Montana! The Montana Sportsmen Alliance appreciates the opportunity to provide comment on HB 752. We are in strong opposition to this bill for the following reasons. The $500 project fee, required of a developer to determine whether or not compensatory mitigation is mandated, is simply excessive. There are numerous individuals or small companies who consult with the Montana Sage Grouse Habitat Conservation Program who would find this fee onerous. The fees if collected, would be better deposited into the Program’s Stewardship account to enhance sage grouse habitat. Whether or not the $500 fee is charged, implementing the provisions of this bill would be time consuming and expensive. Provisions need to be made, to insure funding is available for implementation. Of greater concern is the requirement for predator mitigation in the event sage grouse populations, at the lek or FWP region experience a 20 percent decline from the previous year. In some instances, declines in lek attendance may be simply a result of incomplete counts or birds shifting attendance to an alternate lek(s). Lethal control of magpie, corvid or eagle may be required even though the species are not a causal factor in the decline of the said sage grouse population. Sage grouse population declines are at least in part, a result of other factors such as habitat loss, West Nile virus, and/or severe weather. Removing corvids or magpies when they contributed little to the decline of sage grouse populations may yield few benefits for sage grouse and will require a permit from the Fish and Wildlife Service (FWS). Non-governmental organizations will likely challenge any permitted removal of avian predators. Finally, FWP already has a plan which provides guidance as to when sage grouse hunting will or will not be authorized. We believe FWP should continue to utilize their current guidance when analyzing when and where sage grouse hunting is authorized. The Montana Sportsmen Alliance appreciates the opportunity to provide comment on SB 299. We are in opposition to the bill for the following reasons. In 2013 Governor Bullock established the Greater Sage Grouse Habitat Conservation Advisory Council and as a result of this Council, EOs 12-2015 & 21-2015 were issued. The Montana Sage Grouse Habitat Conservation Program has developed a scientifically sound program, which has buy-in from private landowners, industry and governmental agencies throughout Montana. The Department of the Interior (DOI) removed some restrictions which provided the framework for current sage grouse management in other states, putting more onus on Montana to do the right thing for the bird. Montana is one of the most important states in the sage grouse range. The act would exempt land uses and activities existing as of 01/01/2016 from some of the stipulations defined in the EOs, having the potential to result in the degradation of sage grouse habitat. As stated in the bill, the purpose of the act is to “balance the competing interests of economic development in Montana and conservation of the sage grouse”. In most instances, short term gain will trump the needs of sage grouse, which will ultimately lead to greater impacts to Montana should the sage grouse be listed. However, the Bureau of Land Management (BLM) amendments in other states will be litigated, the results which at best are unknown. Renewed petitions to list the greater sage grouse will be received and analyzed by the U.S. Fish and Wildlife Service (FWS). When the FWS reviews a petition for listing, they consider five criteria, two of which are relevant to this bill. These include; (1) whether the present or threatened destruction, modification, or curtailment of its habitat or range has or is occurring, and (2) the adequacy of existing regulatory mechanisms. If activities were exempted, as identified in Section 1, both sage grouse habitat would potentially be lost and regulatory mechanisms (EOs 12-2015 & 21-2015) compromised and would likely be viewed negatively by the FWS. One possible and real result could be greater restrictions placed on private and state trust lands in Montana. In 2020 the FWS will be conducting a status review of the management actions in place for sage grouse. It is not in the best interest of Montana to take actions which would likely be scrutinized by the FWS during this review. In summary, the risks of SB 299 far exceed any benefits. Thank you.